An artist's depiction of the metallic asteroid Psyche during its hypothesized volcanic phase. The solar system is full of volcanoes — but scientists may have just identified an entirely new type of volcanic activity. That's the suggestion of research being conducted by two separate teams looking at metallic asteroids. Scientists have never gotten a good look at one of these objects, but a NASA spacecraft should arrive at Psyche, the largest of them, in 2026 if all goes well. "It's not a shocking idea, but we'd just never thought about iron volcanism before, so it's something new and interesting to investigate," Jacob Abrahams, lead author on one of the new papers and a doctoral student in planetary science at the University of California Santa Cruz, said in a statement. Here on Earth, volcanoes erupt molten rock, or as scientists call it, silicate crust. And scientists have found traces of cryovolcanism on distant worlds in the outer solar system, where liquid water takes the place of lava. And now, scientists think that under special circumstances, certain metallic asteroids once saw volcanoes of molten iron as they cooled. Scientists believe that these asteroids are the remains of planetesimals, with large collisions stripping away their rocky layers and leaving just a molten, metallic core. Then, that core would solidify. 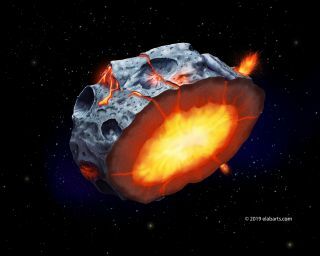 But now, two separate research teams modeling that cooling process have concluded that if the solidification process were to begin toward the outside of the asteroid, some of these bodies may have temporarily hosted volcanoes of liquid metal on their surface, bursting through a shell of solid metal. It's possible there were even different eruption styles for these metallic volcanoes, depending on the precise composition of their molten lava. "If it's mostly pure iron, then you would have eruptions of low-viscosity surface flows spreading out in thin sheets, so nothing like the thick, viscous lava flows you see on Hawaii," Abrahams said in the statement. "At the other extreme, if there are light elements mixed in and gases that expand rapidly, you could have explosive volcanism that might leave pits in the surface." It's much too cold in the asteroid belt now for these volcanoes to be active today, and there's a good chance that in the billions of years since they were erupting, the volcanoes have eroded away. But scientists hope nonetheless that they may be able to spot evidence of such volcanic activity. NASA's Psyche mission is their best hope: It will be targeting the asteroid of the same name, launching in 2022 and arriving at the strange world in 2026. But scientists may not need to visit these metal worlds in order to understand their pasts, since Earth is littered with metallic meteorites originating at these metallic asteroids. These meteorites could show signs of very rapid cooling or of fleeing gas content. Abrahams' and his colleague's research has been accepted for publication in the journal Geophysical Research Letters; Johnson and his colleagues presented their research last month at the annual Lunar and Planetary Science Conference in Texas.